The mechanical power for cycling (Pc) at constant ground speed (s), in the absence of wind on smooth hard terrain is the sum of the power dissipated against rolling resistance, gravity and air resistance: Pc=a · s + M · g · s · sin γ + b · s3, where a and b are constants, M is the mass of the subject plus bike, g is the acceleration of gravity and γ is the angle of the terrain with the horizontal. The constant b depends upon the drag coefficient (Cd), the overall area projected on the frontal plane (Af), and the air density (ρa): b=0.5 · Cd · Af · ρa. 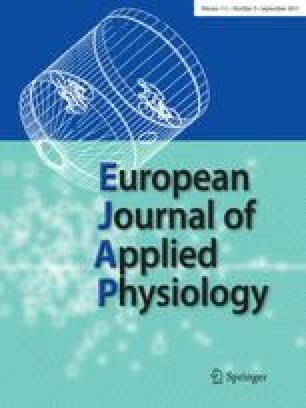 In turn, ρa depends on air pressure (PB) and temperature (T): ρa=ρ0 · 0.359 · PB · T −1, where ρ0 is the air density at 760 mmHg (101.3 kPa) and 273 K. The metabolic power developed by the cyclist (Ėc) is related to Pc:Ėc=Pc·η−1, where η is the mechanical efficiency of cycling. The experimental values of a, b and η are fairly well known so that, if the maximal metabolic power as a function of the performance time is known for a given cyclist, the following set of data can be individually calculated: (1) best performances over any given distance and for any given altitude above sea level, (2) the effects of posture and body size on maximal speeds, and (3) the maximal incline of the terrain that can be overcome at any given speed or coasting speed for any given downslope. The above set of information makes it possible also to calculate the characteristics of a “Twin Bikes System” (TBS) for preventing microgravity deconditioning during long-term space flight. The TBS consists of two bicycles that are mechanically coupled by a differential gearing, which move at the very same speed, but in the opposite sense, along the inner wall of a cylindrically shaped space module. The circular trajectories induce a centrifugal acceleration vector (ac) oriented along the head-to-feet direction of each subject: ac=vt2 · r−1 where vt is the tangential velocity and r the radius of gyration, which is equal to the inner radius of the space module. So, any desired value of ac can be achieved by appropriately selecting vt, wherefrom the mechanical and metabolic powers that the astronauts must generate can be readily calculated. Experiments performed in a ground-based human centrifuge have shown that the discomfort derived from the rotating environment is reasonably low and well tolerated. If the appropriate atmospheric pressure is provided, cycling on circular or elliptical tracks may be useful to reduce cardiovascular deconditioning that occurs due to the reduced gravity in permanently manned lunar bases. Indeed, on the curved parts of the path a cyclist will generate a horizontal outward acceleration: ac=s2 · r−1, where s is the velocity along the track and r is the radius of curvature. To counterbalance ac, the subject plus bike must lean inwards so that the vectorial sum of ac plus the lunar gravity (gL=1.62 m · s−2) is applied along a straight line that includes the centre of mass of the system and the point of wheel contact with the ground. For values of s from 10 to 20 m · s−1 and r from 50 to 200 m, this vectorial sum ranges from 1.05 to 5.03 gL (0.17–0.83 g).